Coleraine grabbed a fourth win in a row as they eased past Carrick Rangers at The Showgrounds. James McLaughlin and Darren McCauley were on target for the Bannsiders, who would have won by more but for Brian Neeson. The Carrick stopper was in inspired form on the day producing a number of fantastic saves. The home side looked like a team brimming with confidence, and they almost broke the deadlock with 90 seconds on the clock as Ian Parkhill fed Darren McCauley. The forward’s first time shot was well blocked by Brian Neeson though. Coleraine were well on top and getting a lot of joy down the left. On 11 minutes McCauley linked up well with Rodney Brown, with the left back whipping a fantastic ball across goal, but James McLaughlin failed to get a touch to the ball with the goal at his mercy. Davy Kee looked certain to score on 16 minutes after Neeson had denied McCauley, the keeper though reacted quickly to parry the Coleraine skipper’s follow up. The Bannsdiers were completely dominant and but for Neeson’s heroics they would have been out of sight. He produced another top drawer save to push away Ruaidhri Higgins’ low drive with 20 minutes played. Carrick’s sorties forward were few and far between. In fact their first shot on target came seven minutes before the break as Adam Sally’s shot forced Chris Johns into action. 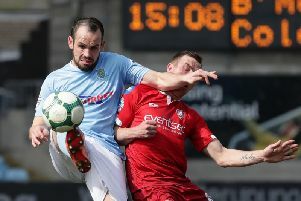 Just before the break Oran Kearney’s men went close again as McCauley teed up McLaughlin on the edge of the box, but again Neeson produced another great save. Coleraine continued to create chances after the break, but again Neeson continued to deny them. Even when he missed Brown’s deep cross on 59 minutes, he reacted well to push away Kee’s shot from Parkhill’s pull back. Coleraine finally made the breakthrough on 70 minutes as Brown’s cross was headed home by McLaughlin. Coleraine: Johns, Kane Brown, Ogilby, Douglas, Higgins, Kee, McGonigle (Twigg 56), Parkhill, McCauley, McLaughlin (Allan 90). Carrick Rangers: Neeson, McKeown, Wilson, Surgenor, McCullough, McNicholl (Lavery 60), Clarke (Chines 77), Murray, Hanley, Rice, Sally. Subs: McFall, Chines, Taggart, Morrow.